Our first target today was St Nicholas Park in Warwick, where we'd expected to find a double helix coaster from Italian manufacturer SBF Rides. The sights and sounds of a busy amusement park were obvious from where we parked our car, but there was a large empty space where the credit was supposed to be. Megan struck up a conversation with a nearby operator, and learned that it had been taken apart at the end of the previous weekend. Unfortunately we were not able to ascertain where it had gone, or whether it might be returning at a future date. We had a second miss a few hours later when we called into Bosworth Water Park near Leicester. Though the Family Roller Coaster was where we expected it to be, a padlock on the entrance gate and covers on the cars made it very clear that this was one credit that we wouldn't be getting today. We've since learned that this ride is an independent concession, and that it only operates on busy days; we'll have to time our next visit for the summer months. Cannon Hill Park is a two hundred acre recreation ground located just a few miles to the south of Birmingham city centre. It was donated to the people of Birmingham in 1873 by Louisa Ryland, a local philanthropist, and features mini-golf, a boating late, sports facilities, a wildlife conservation area, and numerous walking trails. Parking facilities are available, though it's worth noting that the minimum time period visitors can pay for is four hours, making the on-street options nearby worth considering. Those that do use the official location are prompted to enter their vehicle license plate into the payment machine, negating any possibility of recycling tickets. Seven family-friendly amusement rides were added to the park in 2016, taking over one of two fenced-off garden areas close to the center of the facility. They are accessed using a Fun Pass, a rechargeable smart card system used by a number of small parks in the general area. The highlight of the collection is Spinning Coaster (#2390), the second ride of its type in the United Kingdom coming some eleven months after the first premiered at Great Yarmouth Pleasure Beach. Though not exactly a top ten attraction the ride was nevertheless one of the better examples of the breed, delivering quite a bit of spinning and almost no clattering over the four lap cycle. Sandwell Valley Country Park is an enormous facility built on the site of a twelfth century Benedictine monastery. The place has two farms, nature areas, an aerial assault course, mountain bike trails, an adventure centre, crazy golf, and tennis courts. In recent years a small funfair has operated during the summer months with travelling showmen bringing in different rides. 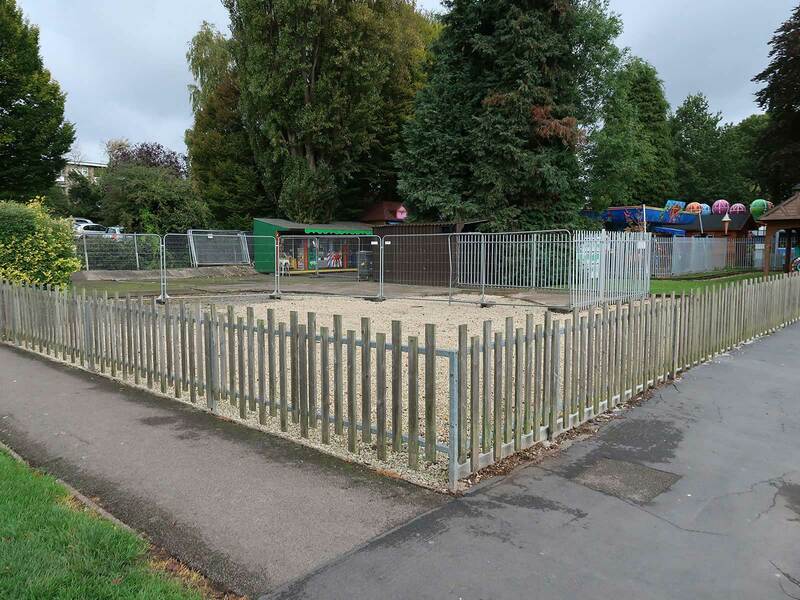 The local authorities have now taken steps to improve the overall presentation of the site; a gravel surface has been laid, and semi-permanent fences have been erected around the key attractions. Crazy Caterpillar (#2391) is new this year, having been delivered to the park in July by the team at Güven Lunapark, now rapidly on course to becoming the most prolific manufacturer of Wacky Worms out there. It is owned by Kayes Events Ltd, who plan to leave it at the park year round with the train being stored on blocks during the winter months. The ride was very slow indeed, particularly in the upper section of the layout, though one presumes it will pick up a bit of speed in time as the mechanism fully breaks in. The final stop for our weekend was at a small park in Stourport-on-Severn that I've never quite managed to fit into an itinerary despite its proximity to Birmingham Airport. Treasure Island Amusement Park was set up by a former travelling showman, and that perhaps explains why it retains the feel of a fairground. 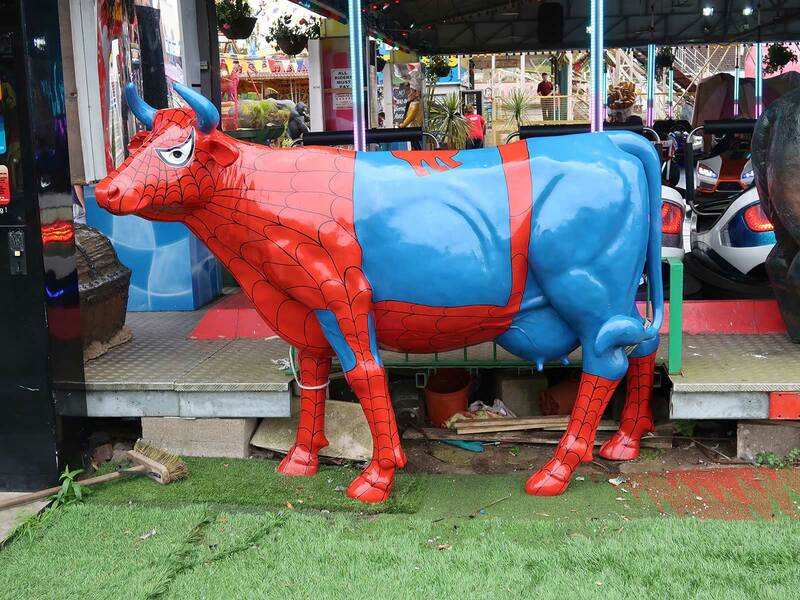 Obvious effort has been made to spruce up the site with all sorts of theming elements, ranging from a four foot high model of Winnie the Pooh to a life-size fiberglass cow in a Spiderman costume, but the various decorations don't quite manage to detract from the fact that the place is dirty, the ground is uneven, and many of the rides are in need of paint. Super Dragon (#2392) is one of a handful of known examples of the Pinfari ST31, a family coaster with the same basic footprint as a Wacky Worm but a much more exciting layout. The ride begins with a diagonal lift hill, followed by a turnaround, a full height drop and climb, a second turnaround, then a drop into an airtime hill. Though still a family coaster the difference in experience against the common design is night and day, especially in the back of the train where there is decent airtime to be had on the initial drop. Our three laps were enjoyable, and we'd probably have gone back for more if we hadn't planned to meet friends for dinner on the other side of the city.